including calcium and carbonyl iron. WARNING: Accidental overdose of iron containing prod-ucts is a leading cause of fatal poisoning in children under 6. Keep this product out of the reach of children. In case of accidental overdose, call a doctor or poison controll center immediately. INATAL Advanced ® is a white, dye-free, oval shaped, oil-and-water soluble multivitamin/multimineral tablet which contains calcium carbonate and carbonyl iron. Vitamin A (as beta-carotene) . . . . . . . . . . . 2700 I.U. Vitamin D3 (cholecalciferol) . . . . . . . . . . . . 400 I.U. Vitamin E (dl-alpha tocopheryl acetate) . . . . . 30 I.U. 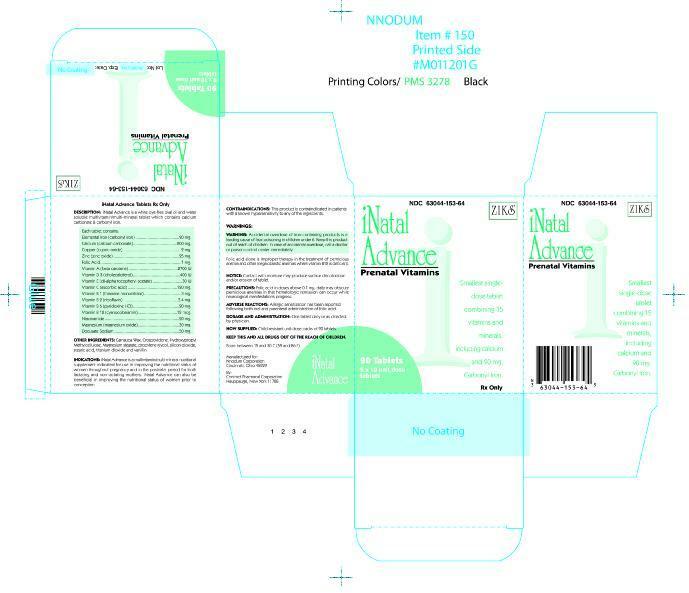 INATAL ADVANCE ® is a multivitamin/multimineral nutritional supplement indicated for use in improving the nutritional status of women throughout pregnancy and in the postnatal period for both lactating and nonlactating mothers. INATAL Advanced® can also be beneficial in improving the nutritional status of women prior to conception. NOTICE: Contact with moisture may produce surface discoloration or erosion of the tablet. Folic acid in doses above 0.1mg daily may obscure pernicious anemia in that hematologic remission can occur while neurological manifestations progress. Clinical studies on this product have not been performed in sufficient numbers of subjects aged 65 and over to determine whether elderly subjects respond differently from younger subjects. In general, dose selection for an elderly patient should be cautious, usually staring at the low end of the dosing range, reflecting the greater frequency of decreased hepatic, renal, or cardiac function, and of concomitant disease or other drug therapy. NDC 63044-153-64 Unit Dose Packs of 90â€™s with each blister card containing 10 tablets per card. Store at controlled room temperature 15°- 30°C (59°-86°F).